More than three million Americans file an identity theft or loan scam complaint every year. That’s almost six people every minute of every day! Loan scams are on the rise and steal billions of dollars every year from people just trying to get the money they need. These hackers and scammers prey on people that aren’t able to get a traditional loan and it’s not just outright theft. I’d consider some of the super-high interest rates on personal loans as part of the problem as well. With so many legitimate personal loan sites out there, you shouldn’t have to worry about getting tricked into a loan scam. Let’s look at some quick ways to make sure an online lender is legitimate before revealing some of the most common loan scams and warning signs. There are four things to check for to make sure a lender is legitimate and quite a few loan scam warning signs I’ll show you in the next section. The easiest check to make sure a personal loan site is legitimate is just to look for the secured site lock in the internet address. This is the little green lock you see next to the website or that the address starts with https – it’s the s that means it’s secured. All lenders much be registered in your state to do business and you can usually check with your state’s Attorney General or Secretary of State office to see if any complaints have been filed against a lender. If a personal loan site says your credit score isn’t important or that it can approve a loan without checking your credit, run away as fast as you can. I’ll cover this again in the warning signs for loan scams but it’s one that is bad news even for legit loan sites. All loan sites are required by law to give you a truth-in-lending disclosure before you agree to terms of the loan. If this document doesn’t show clearly the annual percentage rate (APR), monthly payments, and term of the loan then you’re better off applying somewhere else. All this talk of loan scams and fraud might make you want to avoid personal loans all together. Don’t get too worried. There really are legitimate loan companies and the scammers shouldn’t keep you from getting the money you need. I’ve used a few peer-to-peer and online loan companies, mostly in 2009 and 2010 after I destroyed my credit. I’ll review some of the lenders below before sharing some of the loan scams warning signs you need to know about. PersonalLoans is the online lender I’ve used most, first for a debt consolidation loan and then for a couple smaller loans. The online application is one of the easiest and I got my money from two to five days after approval. Rates average from 9% to 30% on loans depending on your credit and borrowers with a FICO of 640 or higher can usually get approved. Loans are available for up to six years, but you can refinance for longer and monthly payments are fixed. NetCredit specializes in bad credit borrowers and I’ve heard of people with a FICO as low as 580 getting approved on the platform. Rates are a little higher but still competitive with other legit lending sites and lower than most credit cards. Lending Club is the largest peer-to-peer lending site and one of my favorites for investing. I’ve borrowed on the platform only once but have been investing in loans for years. The credit score requirement is a little higher, around 680 FICO, but rates tend to be lower than at other online lenders. If you decide to try a loan at a site other than the three I’ve used, there are a few warning signs to watch for to make sure you’re not getting scammed. First, avoid any website that promises not to check your credit or tells you that credit score doesn’t matter. I know this is tempting for people with bad credit but it’s one of the biggest warning signs for loan scams or just sky-high rates. The fact is that lenders need to check your credit, so they can give you a fair interest rate. If credit score doesn’t matter, it’s only because the rate and fees charged on the loan are so high that it makes it a no-brainer for the lender. You should never have to pay an upfront fee or put collateral to get a personal loan. People have gotten wise to this scam, so fraudsters are now asking for a prepaid debit card or for you to confirm your bank account by sending them money first. Your email inbox is probably the biggest warning sign for loan scams. Any email from a website you didn’t previously apply is probably a scam or charging rates higher than you can afford. The scams are easy enough to see from their misspellings, poor grammar and email addresses that don’t match the company name. Besides the warning signs to avoid loan scams, there are a few tricks fraudsters love to play that you should watch for when looking for a loan. Phishing scams are common everywhere on the internet, but the attraction of easy money makes them especially popular for loan fraud. This is where the scammer sends you an email or gets you to put your personal information in a form. The idea here is that the scammer is ‘phishing’ for your information, enough that they can open a credit card or other account in your name. The information can also be used to hack into your existing accounts. A new loan scam going around is lenders requiring you to set up a prepaid debit card on your loan account. You set up the account and the lender promises to deposit your loan proceeds but then just withdraws all the money in the account and you never hear from them again. The most common loan scam I’ve seen is where borrowers are told to send money from their bank account to confirm the account with the lender. The lender might wire in some money first and ask you to wire it back to them. After your wire goes through, they cancel the original wire to your account and keep the money you sent. A legitimate online lender may deposit money into your account to confirm the account but it will always be less than a dollar. The money will be automatically deducted back out of the account after confirmation and you will NEVER be asked to wire or send money. The first thing to do if you’re the victim of a personal loan scam is to call your local police to file a report. They probably won’t be able to do much about it since it was online but it will start the process. Next, you need to put a freeze on your three credit reports so the scammers can’t steal your identity or open any accounts in your name. This can be done online through each of the three credit bureaus; Experian, Equifax and TransUnion. 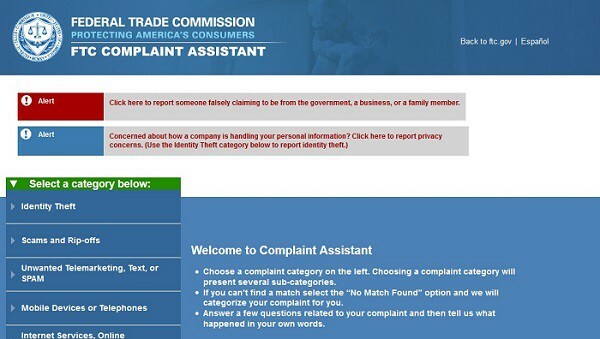 You also need to file a complaint with the Federal Trade Commission (FTC) Internet Crime Complaint Center. They might not be able to do much to resolve your case but this puts the loan scam in their system so everyone can watch for it. Notify the credit bureaus, bank and credit card companies that your identity has been stolen. Ask the bank about cancelling any money sent. It might be too late, but you might still be able to get some money back. You’ll want to check your credit reports every few months after the scam to make sure no new accounts are being opened in your name. The credit freeze should stop this but it’s always better to be safe. It’s extremely difficult to get your money back after a loan scam because most of these frauds take place from outside the country. 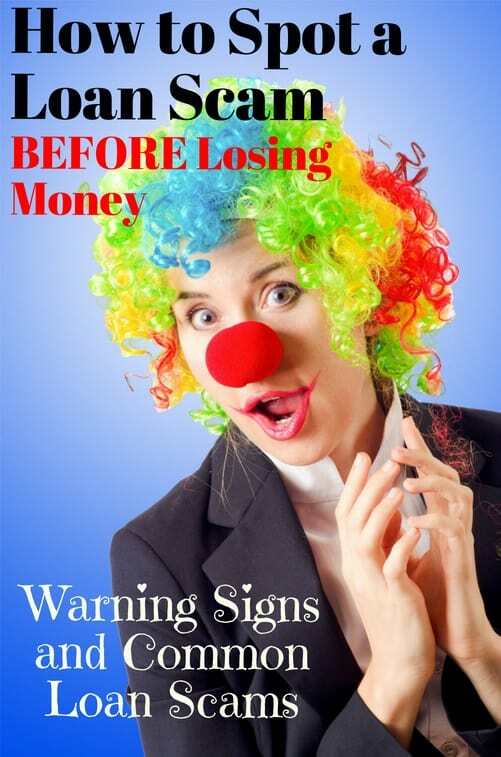 That means knowing the warning signs and only using legitimate personal loan sites is the best way to avoid loan scams. If you are the victim of identity theft or a scam, make sure you act fast to report it before you lose any more money.